In July and August 2013 the Development Policy Centre surveyed 356 stakeholders in the Australian aid program, from the senior executives of Australia’s biggest NGOs and development contracting companies, to the officials of multilateral, partner government and Australian government agencies. The survey asked them what they thought about the Australian aid program, what they liked, what they didn’t like, what they thought the future of aid was and what needed to be done to improve our aid. And now the verdict is in. 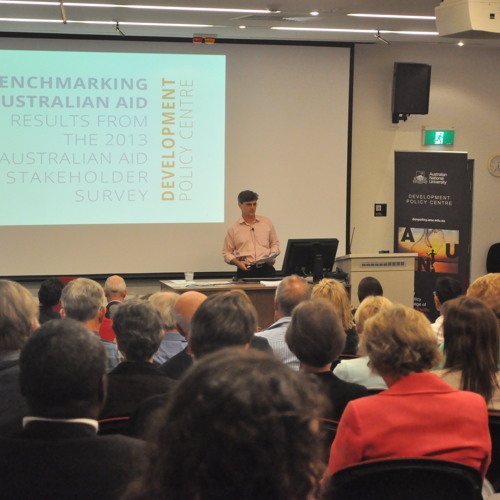 This even launched the results of the 2013 Australian aid stakeholder survey. It’s a unique exercise, with a distinctive set of results. More than a baseline for future improvements, it’s a stocktake on where Australian aid has got to, and a critical input into where it needs to go. The event will tackle questions such as: - Is our aid getting better or worse? - How do we compare to other donors? - What is our biggest strength, and what’s the biggest weakness? - How important is the national interest in aid decisions, and how important should it be? The 2013 survey launch revealed how Australian aid stakeholders answer these questions, and many others, and discussed the implications of the finding. Stephen Howes, Director of the Development Policy Centre will present the survey results. Marc Purcell, Executive Director of the Australian Council for International Development (ACFID), and Mel Dunn, Chair of International Development Contractors (IDC) Australia will discuss the results. Stephanie Copus-Campbell, CEO of the Harold Mitchell Foundation will chair proceedings.